CRIKEY: Where's the outrage over Sami al-Hajj? African-American comic and anti-racism activist Preacher Moss frequently uses a joke about black men and the American justice system. Perhaps he was making a reference to Guantanamo Bay detainees. Certainly I'm not aware of any Columbian FARC terrorists being kept there. Last September, Crikey reported on the fate of Sami al-Hajj, a Sudanese national who worked as a photo-journalist for al-Jazeera. Al-Hajj had been detained at Guantanamo Bay after being picked up at the border between Afghanistan and Pakistan in December 2001. He was delivered to the Americans by immigration officials. You can read about the whole gruesome story here. Well, it turns out that al-Hajj was released from Guantanamo with eight other detainees a few days ago. He wasn't charges with any offence, and had been on a hunger strike during the final 16 months of his seven year internment. ... not beaten, but he was infected with scabies while in a bug-infested jail. He was finally brought before a court after four nights in jail and then released. In Guantanamo, you have animals that are called iguanas ... that are treated with more humanity. Let's hope al-Hajj finds the strength to write about his experiences, following the lead of former British detainee Moazzam Begg and German detainee Murat Kurnaz. An excerpt from a translation of Kurnaz's book (originally written in German) can be read here. 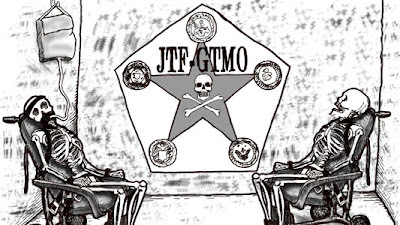 Al-Hajj has, however, drawn some sketches depicting the brutish life of Guantanamo detainees. News Limited papers have rightly complained of the treatment of Fiji Times managing director Evan Hannah. Kevin Rudd has described Hannah's treatment by the Fiji government as a "reprehensible attack on human rights." New Zealand PM Helen Clark has made similar remarks. I agree with both of them. But seriously, where were they when another journalist was kept at Guantanamo Bay? And was Hannah tortured whilst by the Fijian regime whilst in custody for seven years? Was he repeatedly bashed and denied even basic medical care? If deportation to one's home country is an attack on human rights, it's the sort of attack I'm sure more Guantanamo detainees could well do with. They could also do with some advocacy on their behalf from the so-called free world. First published in the Crikey daily alert for Tuesday 6 May 2008. Read about my allegedly terrorist past with the Tabligh Jamaat (TJ) here. Shake your head and wonder about the non-universality of human rights here. I think that's about it. 'Till next time, seeya!